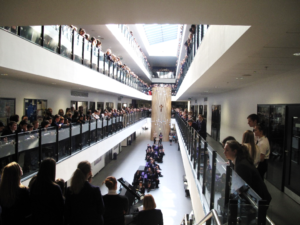 Every term there are whole-school worship services that take place collectively in the main hall space, or as an extended form time that includes specific activities for students to connect with. These services follow the major Christian festivals and celebrations. During these times, we share bread and wine together. Christian values of our school community. St Hilda’s students, staff and governors are really pleased to introduce our new chaplain – Mike Wildsmith. Mike is already incredibly involved in the life of the school as a governor and we are very blessed to also have Mike as our chaplain. Mike grew up in Yorkshire and came to University in Liverpool in 1984. Having worked as a business consultant for 13 years he was called to fulltime Christian ministry in 1999, serving in churches in Leeds and Liverpool. He is currently one of the pastors at Bridge Chapel in South Liverpool. Mike is married and has two adult children, one of whom – Molly – attended St Hilda’s from 2010-2014. Welcome, Mike. We are all looking forward to working with you to build on the worship within the school, and beyond.